Heavy rainfall is a big part of Tropical Depression 9, which is strengthening in the Gulf of Mexico. The Global Precipitation Measurement mission, or GPM, core satellite passed over the gulf in space and measured that rate of rainfall. The National Hurricane Center (NHC) expects Tropical Depression 9 to intensify over the next day or so. Vertical wind shear is predicted to be low and the tropical depression is moving over warmer water. Both of these factors will provide fuel for intensification. The GPM core observatory satellite scanned the tropical depression on Aug. 31, 2016, at 2:46 a.m. EDT (0646 UTC). 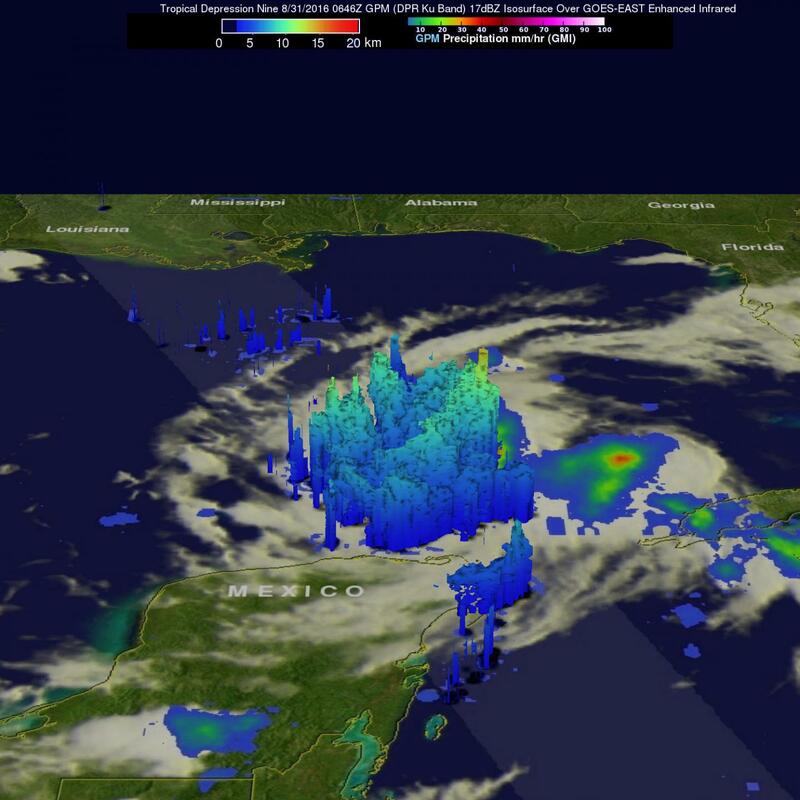 GPM's Microwave Imager (GMI) and Dual-Frequency Precipitation Radar (DPR) instruments saw heavy rainfall in strong convective storms in the Gulf of Mexico northwest of Cuba. GPM's DPR found that some of these intense storms were dropping rain at a rate of greater than 4.1 inches (105 mm) per hour. Data from the GPM satellite's radar (DPR Ku Band) was used to examine the shape of precipitation within Tropical Depression 9. 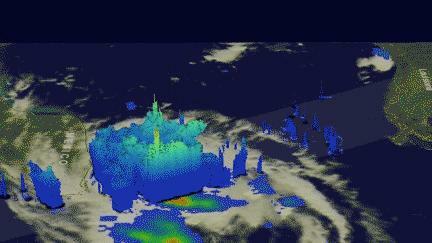 This 3-D examination of precipitation showed that some tall convective storms were reaching heights above 9.9 miles (16 km). Radar reflectivity values of over 52 dBZ were returned to the satellite providing more evidence of the intensity of downpours in the area. Rainfall within the tropical depression supplies additional energy needed for intensification. At 8 a.m. EDT (1200 UTC), the center of Tropical Depression 9 was located near 24.6 degrees north latitude and 88.1 degrees west longitude. That's about 400 miles (645 km) south-southwest of Apalachicola, Florida and about 420 miles (675 km) west-southwest of Tampa. The depression is moving toward the north near 2 mph (4 kph). NOAA's National Hurricane Center said that a north-northeastward motion at a faster forward speed is expected to begin later today, Aug. 31, and a turn toward the northeast is forecast tonight. On the forecast track, the center of the tropical cyclone will approach the northwest Florida coast in the warning area on Thursday afternoon. The estimated minimum central pressure is 1001 millibars.